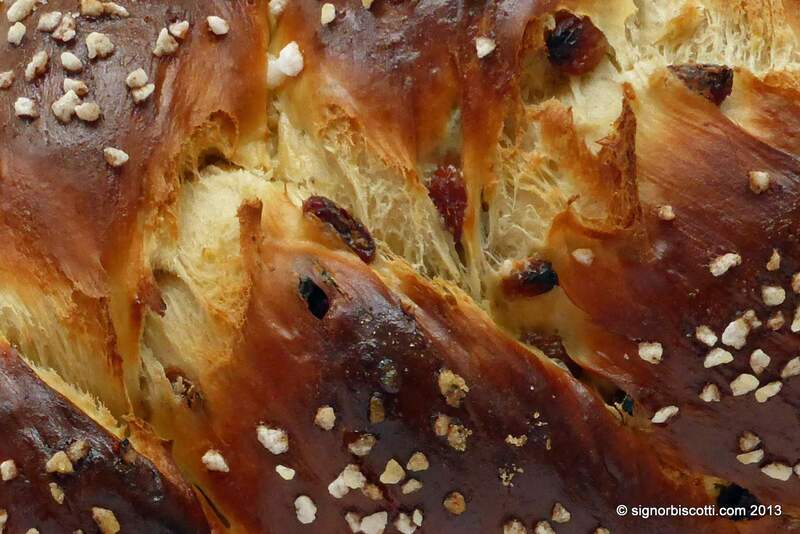 Tsoureki is a traditional Greek Easter bread. It is very fragrant and flavoursome, with a texture almost like brioche, and has a distinctive aroma and taste, coming mostly from the characteristic Greek flavourings of mahleb and mastika. I must admit I’m not sure how traditional my version is, as there are a few added ingredients that I suspect are not very orthodox. I have also left out the 3 bright red hard boiled eggs with which it is often adorned to symbolise the Holy Trinity and the blood of Christ. But for all that, it is a beautiful thing, both in appearance and flavour. I decided to try my hand at Tsoureki after seeing Paul Hollywood make it in a Great British Bake Off masterclass. But Easter came and went and I still hadn’t got round to making it. Then I realised Tsoureki was one of the recipes set as a challenge for World Baking Day on May 19th May 2013 (at level 97 out of 100!) and this spurred me to action. Vicky Koumantou provided the recipe. Her Tsoureki was beautifully formed and decorated, and she included a very useful video (in Greek with English captions). My ingredient list is an amalgam of Paul and Vicky’s and I have written the method to suit my way of working. This bread is lovely on its own, or with butter. It keeps quite well, and makes delicious toast that will fill the house with the same heady aroma as when it was first baked. Heat the milk and butter in a small saucepan until the butter has melted, then add the water. Leave to cool until lukewarm, if necessary. Put the flour in a large bowl, and stir in the yeast, salt, caster sugar, mahleb, mastika, cinnamon and orange zest. Add the milk mixture and the two eggs, and mix until all the flour has been incorporated. The dough will be very moist and sticky at this stage. Turn the dough out onto an unfloured surface and knead or work it for 5-10 minutes, until it is smooth and elastic. It will still be very sticky, but you should find it has the strength to stand up in a mound. You could if you prefer do the mixing and kneading in a mixer, using the dough hook. Incorporate the sultanas into the dough. I do this by flattening it out a bit, sprinkling the sultanas on top and then using my scraper to help me fold the dough over the sultanas. Scatter a little flour around the dough and, with the aid of your scraper, form it into a ball. Return it to the bowl, cover with clingfilm, or a shower cap, and leave to rise until at least doubled in size. As the dough is very rich, this will take considerably longer than normal. I left mine overnight in a cool room. Scrape the dough out onto a lightly floured surface, pat it out into a rough rectangle and then roll up like a Swiss roll. Even the roll up by rolling and patting. If making a single large loaf, divide the roll into three, roll each piece into a strand about 40cm long and make a plait. If you are making two smaller loaves, first divide the dough into two. Cover with a clean tea towel (or cover loosely with clingfilm) and leave to rise until doubled in size. This rise could also be slower than normal. About an hour before baking beat the egg for the glaze with a pinch of salt. Preheat the oven to 200C (adjust for fan oven). Just before baking, brush the loaves twice with beaten egg and sprinkle with the topping(s) of your choice. Bake the large loaf for 20-25 minutes, and the small ones for 15-20. Turn the tray(s) after 10 minutes to ensure even browning. The loaves should be a rich brown colour, but if you think they are browning too much, cover them with a sheet of foil or greaseproof paper. Transfer carefully to a wire rack to cool. I enjoyed the Tsoureki so much that I decided to make it again, and to attempt the six stranded version demonstrated in Vicky’s video (04:25 onwards). Although this is in Greek, with just a few English captions, there is a great deal to be learned from it. I watched it carefully, made notes, transcribed the plaiting pattern, did some practise with piping cord, then set to work on the real thing. I was very pleased with the results. 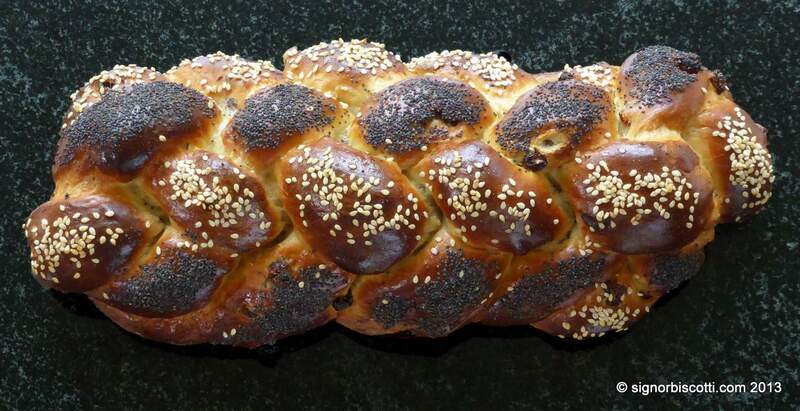 I intend to publish a post shortly about plaiting techniques, as part of a series on “Beautiful Bread”. Mahleb and Mastika are two characteristic Greek spices. You may be lucky enough to find them in your local delicatessen. No chance of that in the country town where I live, but I found several suppliers of both on line. Mahleb is also used throughout the Mediterranean and goes under a number of names (see Wikipedia for a list). It is made from the seeds of the St Lucie cherry. The seeds look a little like miniscule almonds. You can grind them easily yourself in a pestle and mortar or you can buy them ready ground. I have used both, and have noticed no difference in flavour, although I have read that the ground version quickly loses its flavour. If you try some of the spice raw it first has a strong taste rather like bitter almonds, and then you will get a fruity and flowery aftertaste with hints of cherry and rose. In a bake it gives a very distinctive aroma and flavour. Mastika is a resin from the mastic tree, usually sold in little nuggets. It gives a resiny flavour with a hint of aniseed. Be aware that if you grind it on its own it will form a sticky, difficult to shift mass in the bottom of your mortar. Grinding it with a few tablespoons of the sugar from the recipe will prevent that happening. I am submitting this post to Panissimo, a biweekly collection of breads from Italy and around the world, run by the authors of two beautiful blogs, Barbara from Pane e Companatico (Bread and What-goes-with-it) and Sandra from Indovina chi viene a cena? (Guess who’s coming to dinner). My thanks to Barbara and Sandra for this great initiative which has got off to a brilliant start, and I am delighted to be taking part. It’s just a little amusing that my first entry should be a Greek bread when I have posted so many Italian bakes in the past! Beautiful. Seriously impressive loaf. We can buy mastic here in Dubai – it’s used in Middle Eastern ice-cream making I believe. Signor Biscotti, you’ve made me really happy! I’m so glad that we’ve joined forces to celebrate tsoureki. It’s a greek sweet bread, so tender and loving, that everyone should be tempted to put hands in the dough. I am so glad, as well, that the video helped you understand the steps, as if we were baking together. 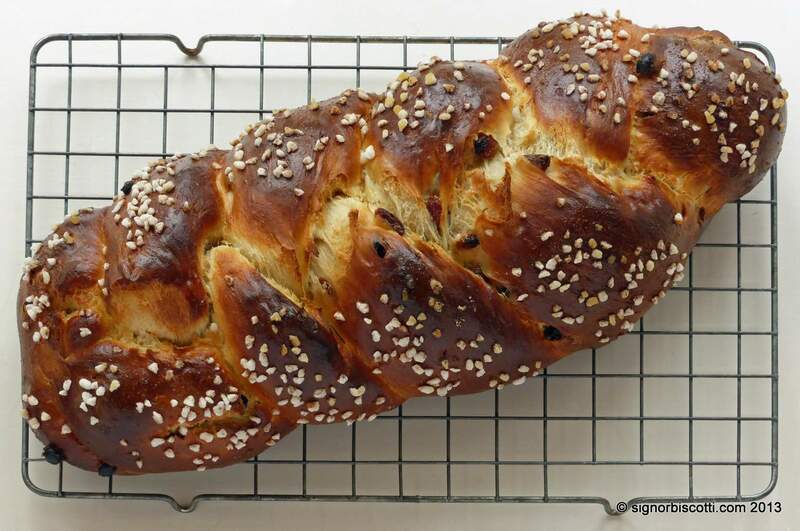 Tsoureki is perceived to be the most challenging bread to make. Although it was your first time, you made it happen. Well, well done! Hi Vicky. I’m so sorry to have taken so long to reply to your comment. My blog has been rather neglected of late 🙂 Tsoureki is something I shall definitely be making again, no small thanks to you! I’m so glad that I found this site, so beautiful + inspiring! Thank you lamassu, I’m glad you like the site. I’m intending to get back into regular posting again soon 🙂 Thank you so much for the tip about http://www.thespicery.com/index.html it looks a great site, and in the UK what’s more. I like that they’ll sell you a “pinch” (actually a teaspoon) of something too. Very handy when trying out something new.